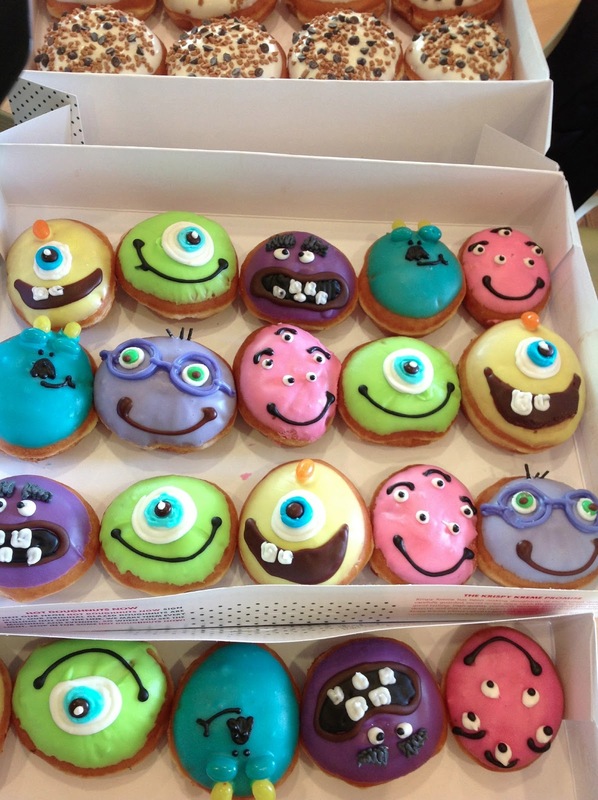 Mike Doughnut - Just like A-student Mike Wazowzki, the Mike mini doughnut is made of full-on win with chartreuse vanilla coating and vanilla icing – a fitting treat after the day’s study session. Sully Doughnut - If your fierce school spirit is more evocative of James P. Sullivan’s prowess, then sink your teeth into the Sully doughnut – a mini doughnut with sky blue vanilla coating, pineapple and blueberry jelly beans, and black chocolate icing that form the top scarer’s growling smile. Randy Doughnut – Craving the luscious taste of vanilla? Then satiate your sweet tooth with the Randy mini doughnut dipped in lilac, vanilla and white vanilla icing, and then topped with chocolate sprinkles. Terri Terri Doughnut - If one monster can already knock you off your feet, then try having two of them. The Terry/Terri mini doughnut, made luscious by a passionate lemon-flavored white chocolate icing, orange flavored jelly bean, and sugar-coated brown candies, channels one half of the four-armed, bickering Siamese brothers like a charm. Art Doughnut - For an offbeat delight, go ahead and grab an Art mini doughnut that’s dipped in passionate grape-flavored white chocolate icing, black vanilla kreme and vanilla icing to resemble the furry, purple ball of bad. Squishy Doughnut - If you’re into something sweet and small, then delight yourself with Squishy mini doughnut, which is as adorable as the five-eyed, jelly-like monster, made even more delectable with pink vanilla icing and black chocolate topping. So base from those information, choose what you want! I'm sure you will think twice devouring them! Meanwhile, I'm so lucky enough that Krispy Kreme (Cebu, IT PARK branch) shared some of their delectable doughnuts! If you are crazy about the Speculoos Cookie Butter, well, Krispy Kreme came up with 2 doughnuts filled with Speculoos cookie butter inside it which are dipped in white chocolate and/or dark chocolate then topped with French biscuit (Dark Chocolate Vanilla Cookie Butter) and/or with Belgian chocolate and caramel crunch (White Chocolate Vanilla Cookie Butter). I had uncontrollable sugar-rush that time and to add more to a sinful day, set before my eyes were Salted Caramel Doughnuts and my fave, Kreme Brulee Doughnuts! These sweets definitely tempted me. I'm guilty as charged! -Save Php 1.00 on your coffee when you show a Krispy Kreme coffee sleeve! -Save Php 10.00 the next time you visit any Krispy Kreme store if you bring along with you their KK ECO BAG!